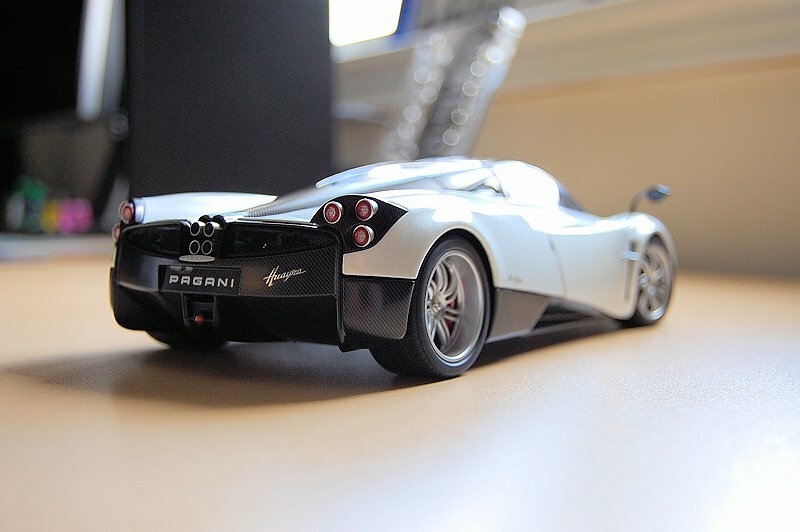 As Pagani Zonda’s replacement, the Huayra had big shoes to fill even before it touched the ground. 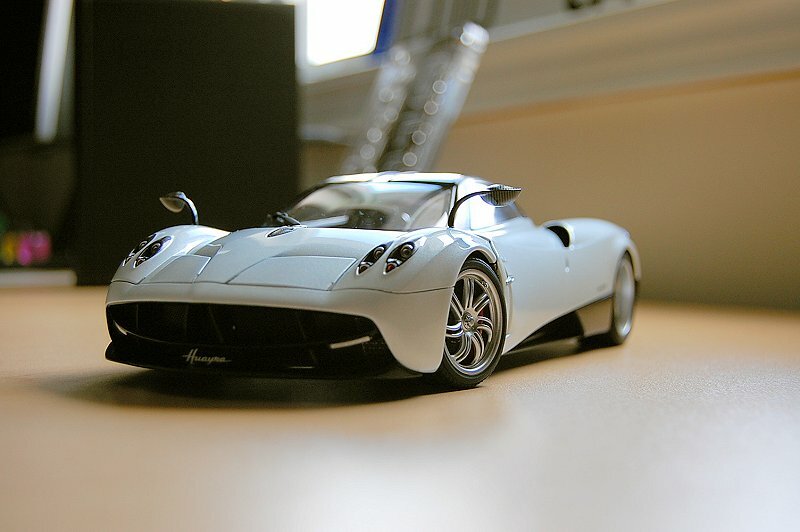 The given name Huayra means “God of the winds” elevated the expectations even more. Well, critics and skeptics were quieted when the car was officially unveiled at the Geneva Auto Salon back in March 2011. 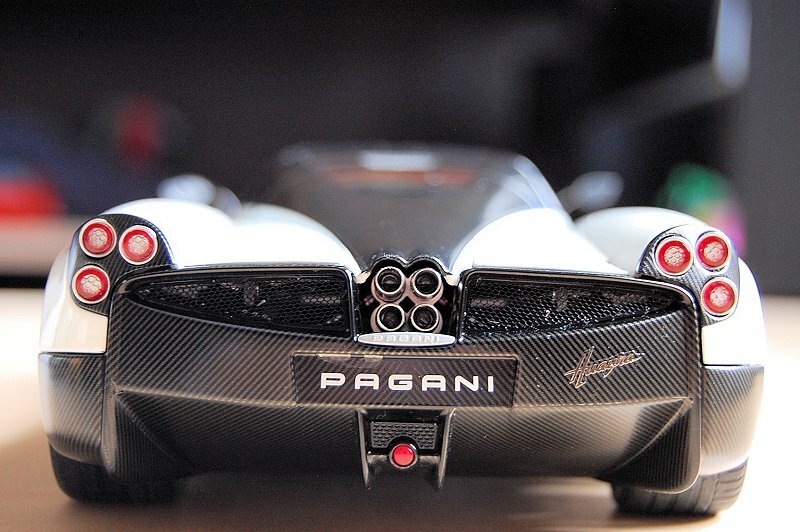 The car’s performance comes from multiple synergies, and the AMG power plant performs and looks like a piece of art, but the Huayra’s success relies more on all the pieces of the puzzle coming together. 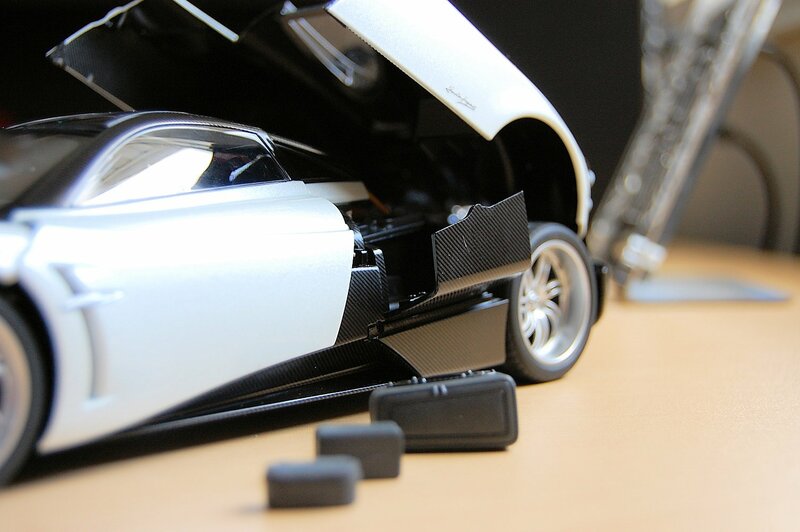 The craftsmanship of the chassis featuring carbotanium monocoque construction and advanced material provides strength and weight reduction. 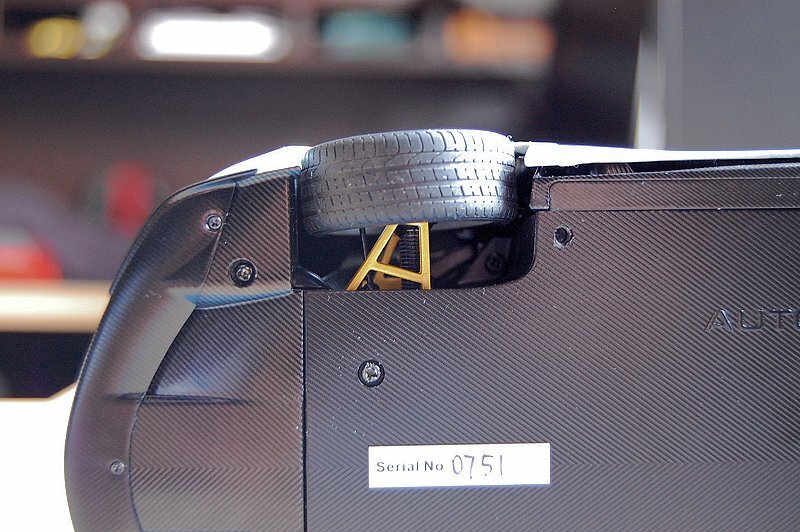 Each bolt and nut on the car is a custom made piece crafted from titanium, which provides strength and weight savings. The active aerodynamics system is state of the art, which incorporates flaps/spoilers found front and rear – achieving less drag and maximum down force. And the aforementioned Mercedes-Benz AMG V12 6.0L motor helps propel the Huayra to 231 mph or 372 km/h, while producing 730hp and 740 lb·ft of torque. While taking the model out from the styrofoam packaging shell, you can already see and feel the quality of this replica. The model definitely has substance and presence. There is a little assembly required; the end-user needs to plug in both left and right side mirrors. The mirrors are shipped in a small plastic bag along with a screwdriver. 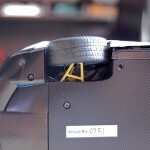 The screwdriver is utilized to access the front and rear section of the model. 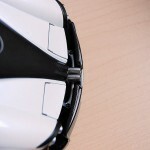 AUTOart cleverly secured both sections with four small screws. Tip for anyone deciding on purchasing this model, READ the instructions that ship with the model. Second, use a small magnet to magnetize the tip of the screwdriver to make removing of the four screws a lot less frustrating. 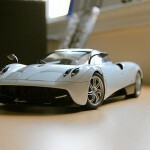 In my opinion, the exterior view of the Huayra is striking, the car looks quick just sitting there. 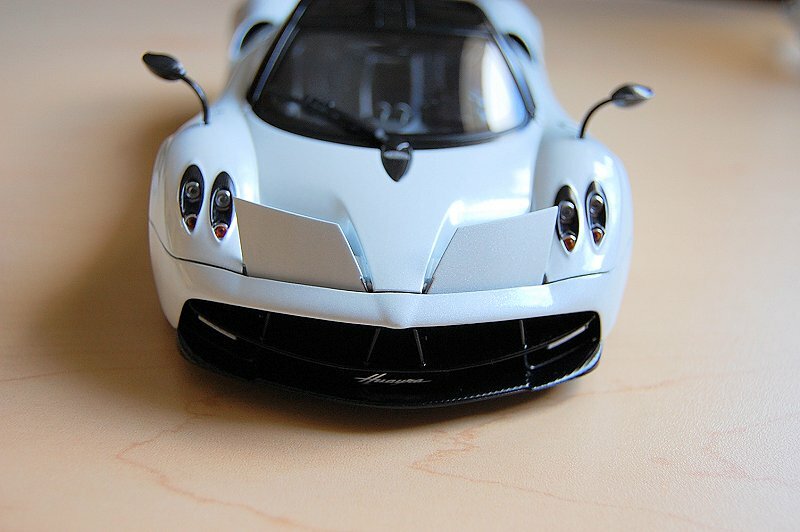 Overall body lines seem to be within spec and capture the beautiful curves of the original supercar very well. Ride height is spot on, for me at least, though as the photos will show, the front hood section isn’t perfectly aligned (in the closed position) with the mid-section. To be honest, it looks worse in the photos than it actually is. Also, with the exterior being finished in white, the smallest discrepancies are thus accentuated. I’m very critical of these things, but it still passed my OCD test. 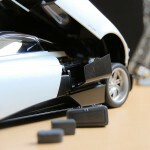 Many people from DiecastSociety.com forums have complained about the boring white exterior colour. 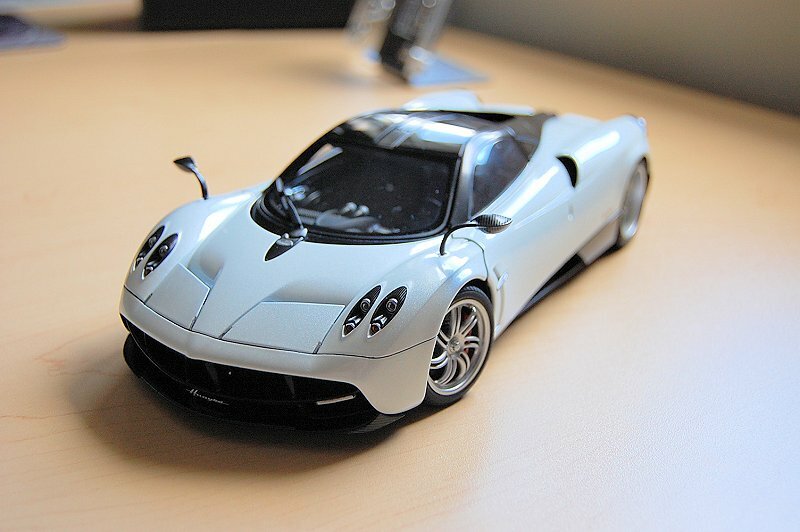 I’m usually a fan of white cars, but in this case I have to agree, the Huayra deserves a little more flash, though I was pleasantly surprised with the white colour in person. Honestly folks, pictures don’t do the colour any justice. 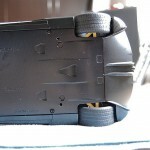 One thing I like to point out: the under body section of the painted front and rear section are not fully clear-coated. This could lead to premature paint chipping upon opening and closing each area. This is a let down for a model commanding $380CND. 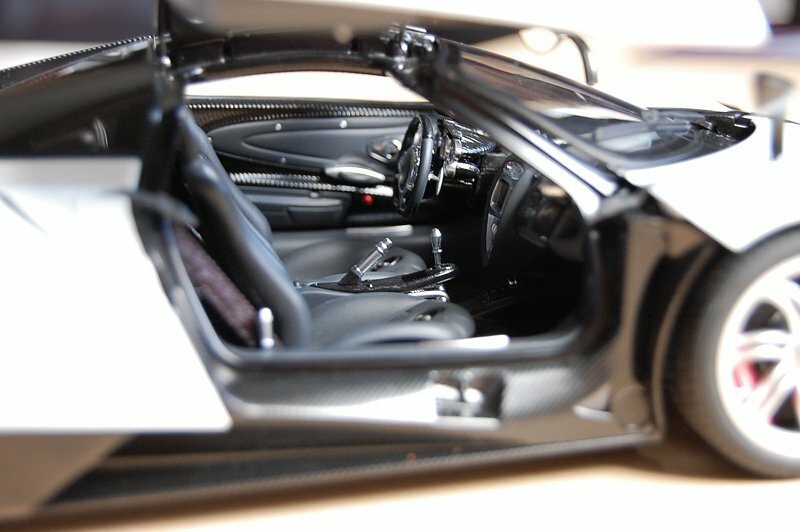 Carbon fibre work is excellent throughout. AUTOart has definitely mastered the technique. 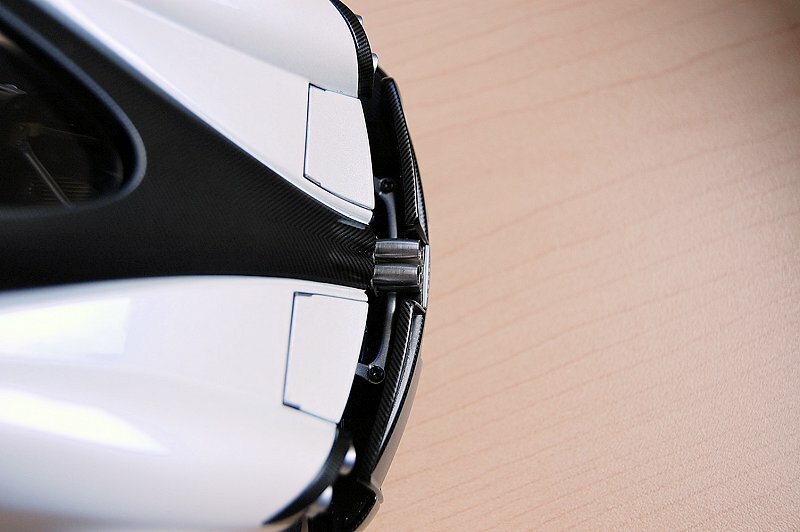 Front section features functioning flaps, and both pieces work independently and flawlessly. 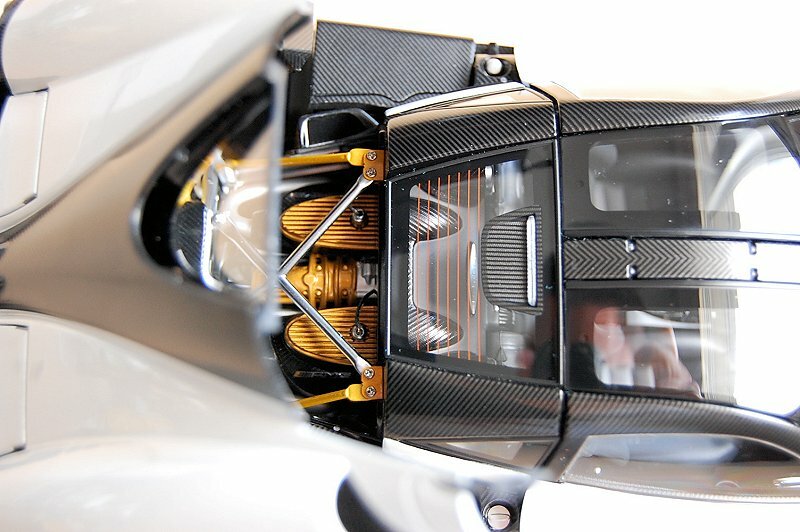 Detail on the lower fascia is nicely covered in carbon fibre. 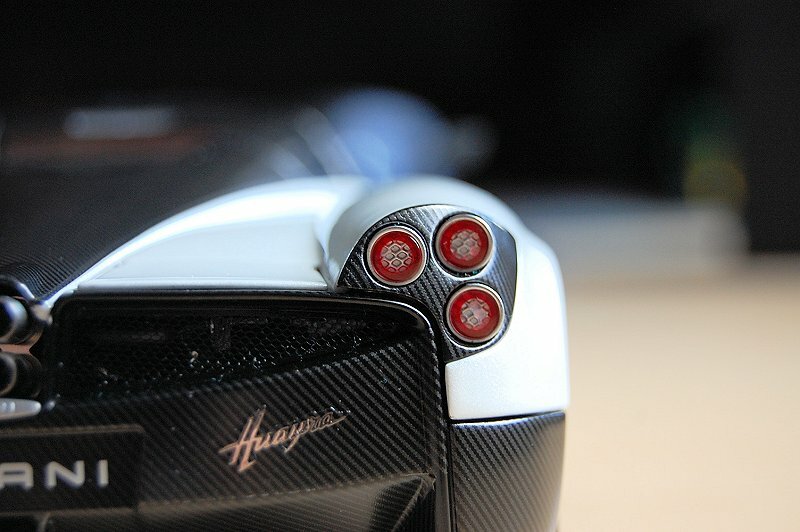 LED indicators, detailed headlights and the Huayra badge round out the beautifully detailed package. Rear section is much the same. The beautiful quad pipes from the exhaust are exposed and beautifully finished. Perforated grilles provide a glimpse at the monster engine lurking beneath. 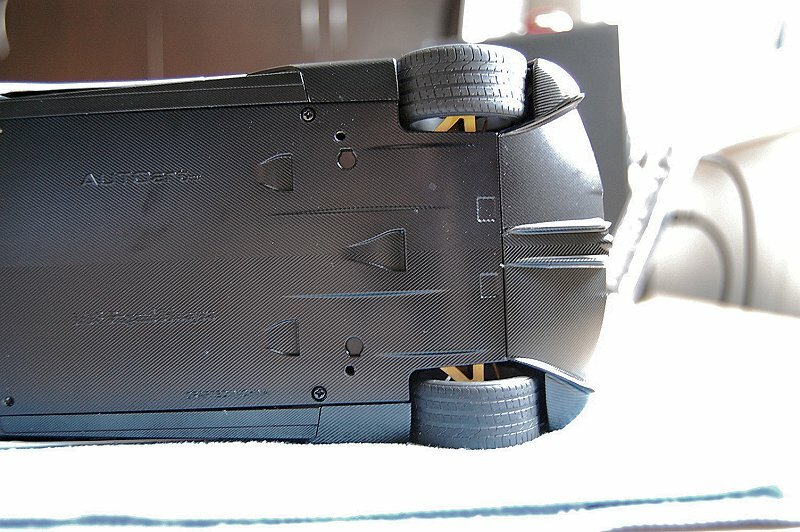 Lower section is completed in carbon fiber, which extends to the front of the model’s undercarriage. Again, active aerodynamic flaps are fully functioning in the rear as well. 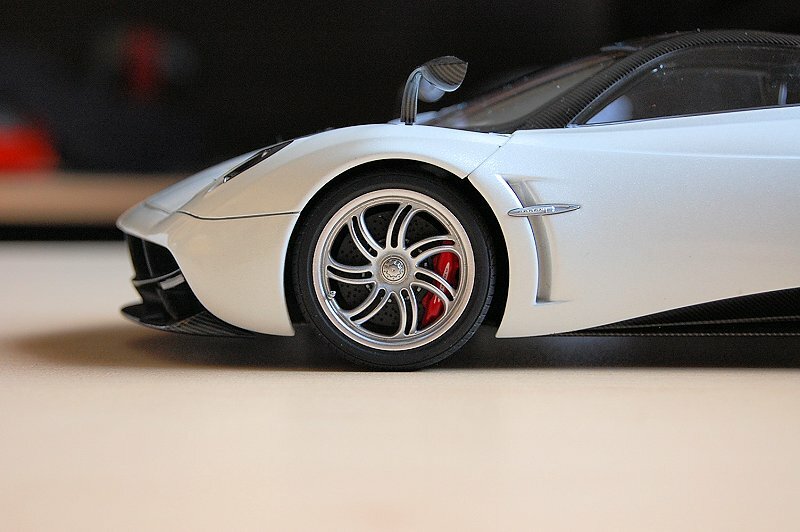 The wheels on the Huayra are beautifully executed as well. I do apologize for the dark photo, but trust me, the entire package is top notch! Front and rear wheels both have the perfect offset too. 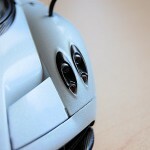 AUTOart even replicated the valve stems and caps as designed by Horacio Pagani, well done. 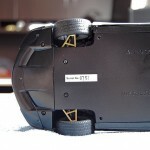 As mentioned earlier, to access the front section of the model, you will need to remove two small screws – both located underneath the model. Remember to keep the doors in the open position when doing so. 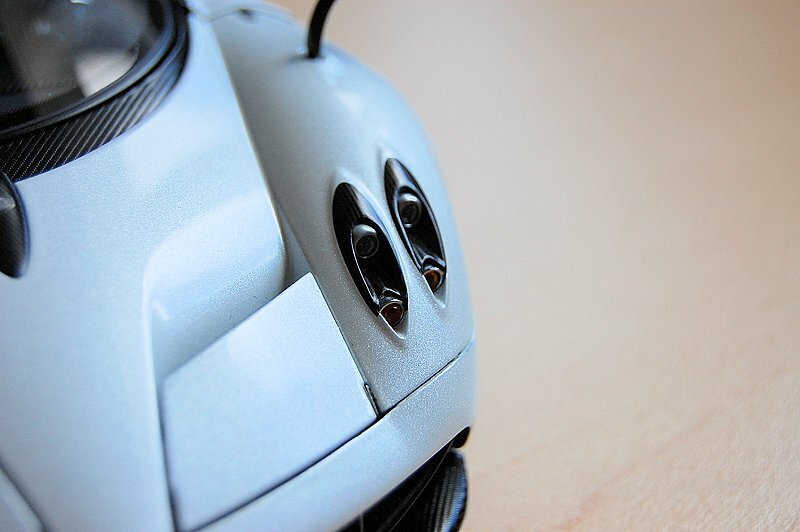 Once inside, the eyes are treated to a feast of carbon fibre and AUTOart ingenuity. 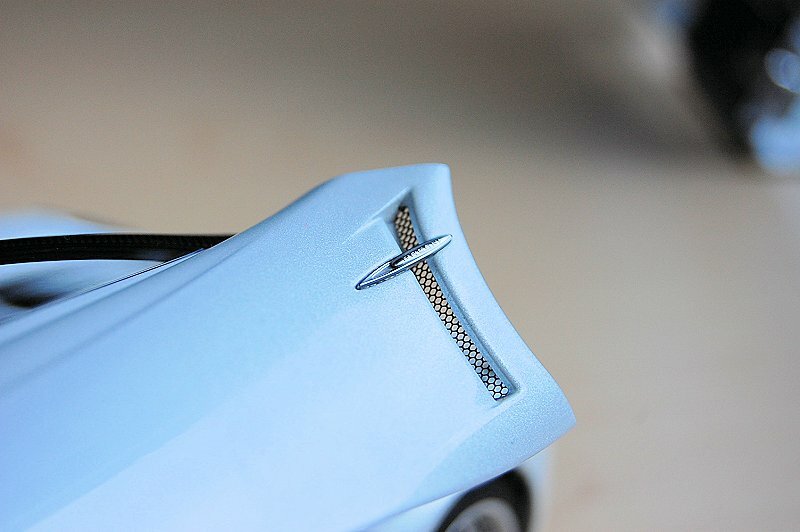 This is where the model really starts to shine, and where a fan of models cars can appreciate the finer detail found on this replica. Again, I have the need to call-out the great carbon work. 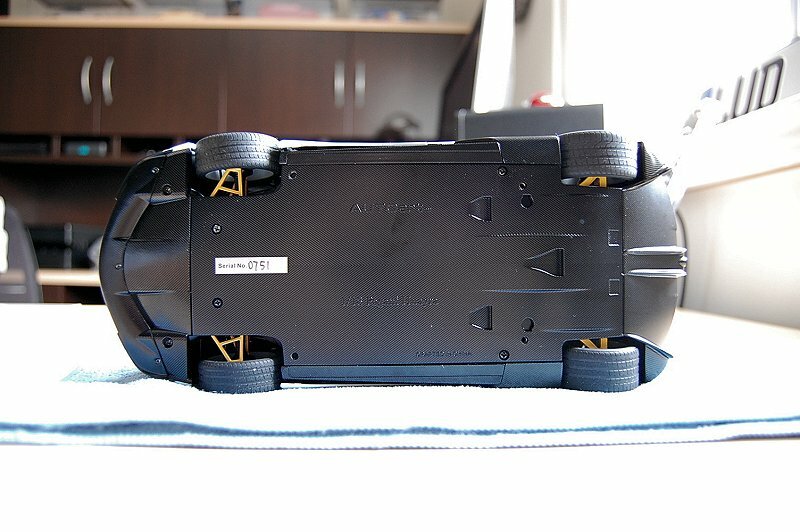 The underside of the hood and structural bits really add to the level of realism, something you’re not going to get in a resin model. 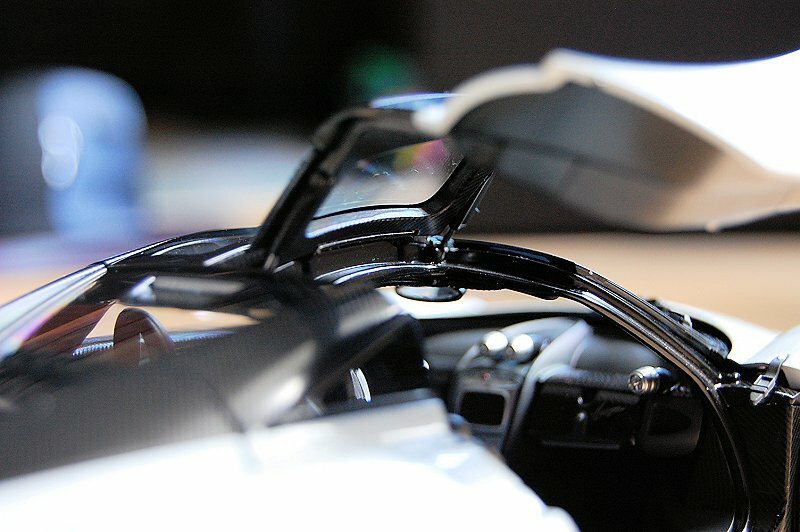 Suspension components, though limited in view, are fabricated in metal. Moving to the rear section, you once again need to remove two screws. These are hidden just inside the door opening on either side of the car. The attention to detail here is exceptional in my opinion. 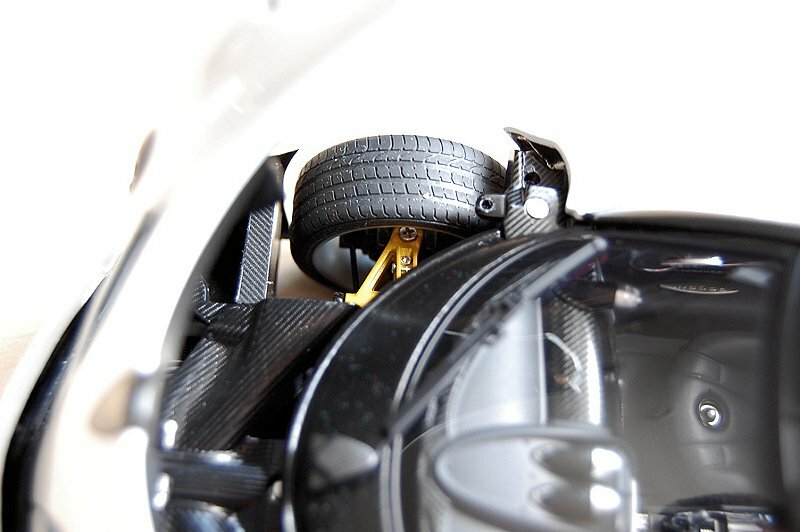 The rear features a fully working suspension, highly detailed motor, very little plastic, and excellent carbon fiber craftsmanship. 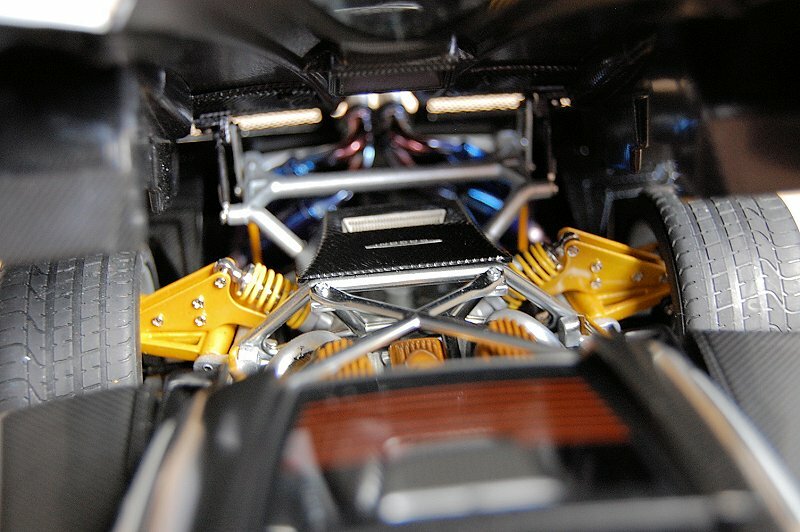 I have to point out AUTOart’s excellent reproduction of the artisan exhaust system, fantastic work on capturing the transitional colours throughout. 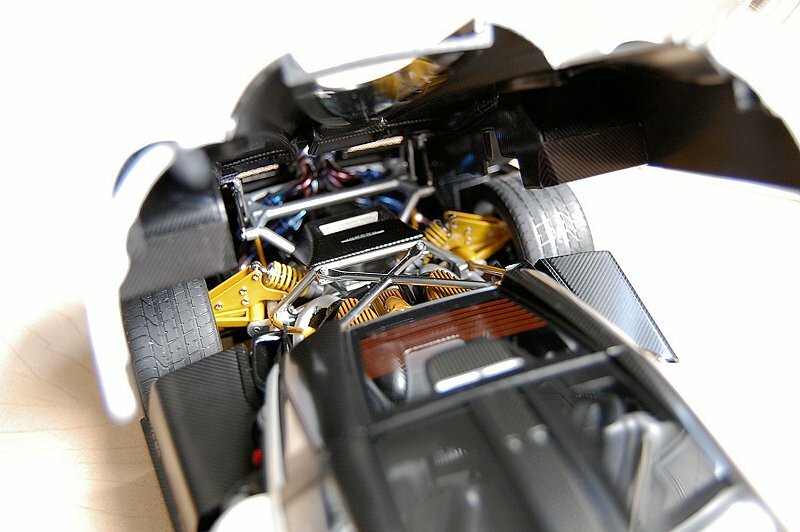 Each side of the engine compartment features storage, each beautifully crafted into the chassis and fitted with luggage. Both sides on this particular model worked without issue. Well done AUTOart. 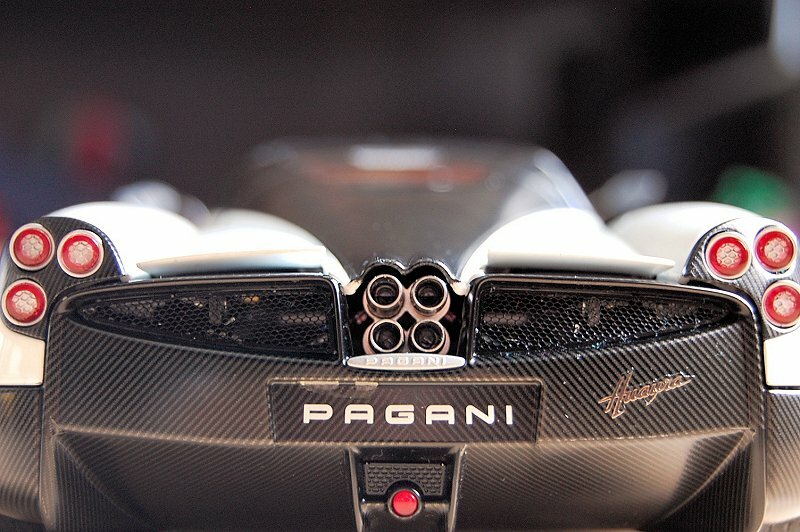 As one would recognize Pablo Picasso as an artist of painting, sculptures, and drawing, Horacio Pagani will go down in history as an artist of metal, carbon fiber, and leather. 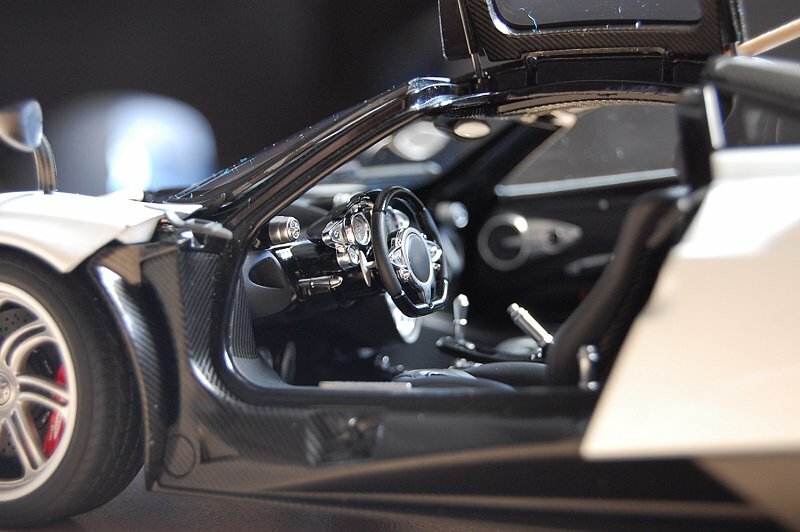 As you look inside the cockpit of the Huayra, one can appreciate the level of form, function and art. 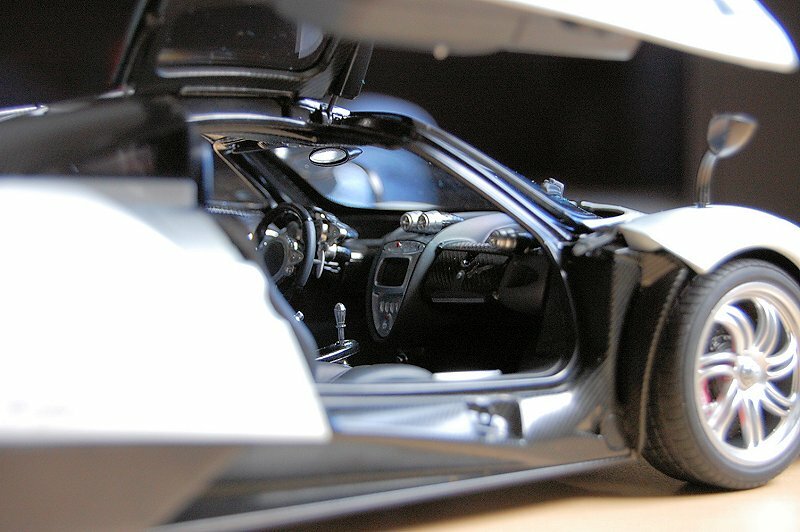 AUTOart’s reproduction of the Huayra’s interior is exceptional; they succeeded in capturing all the aforementioned elements, true eye candy for the senses. I’ll let the photos speak for themselves. If I had one complaint, it would be the lack of support of the driver’s side door. It would not sit in the open position, and required use of a toothpick to stay open. 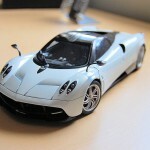 In my opinion, AUTOart hit the mark with the Pagani Huayra. Overall execution is top notch for the most part. My noted flaws are small based on the various talking points. 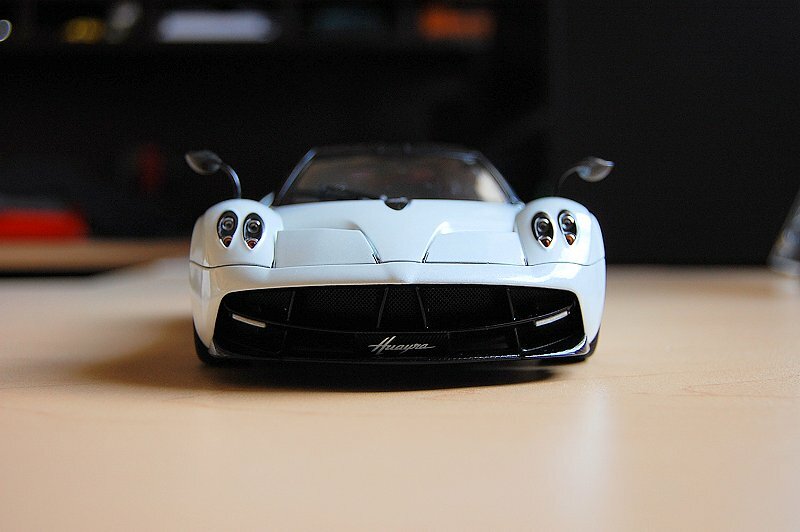 Since my collection’s primary focus is sport and supercars, this one is a must for me. Do I recommend it? Hell yes! As for the $380CND price tag, the model is definitely at their top end. 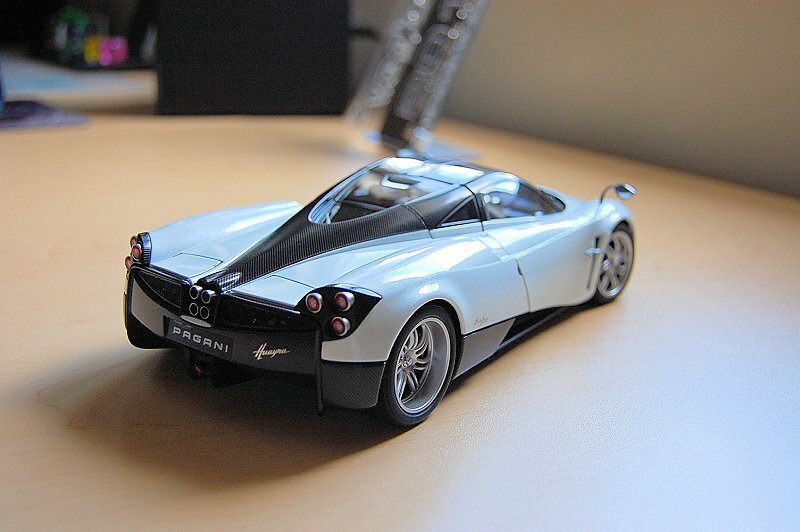 Based on an earlier release, the Pagani Zonda R, it’s about $120 more. Worth it or not, you decide, though keep in mind, we have sealed resin models available today commanding $500, $600, $700! None can hold a candle to this one. What we have here is a very solid contender for model of the year. I know where my vote is going. Enjoy the pics! 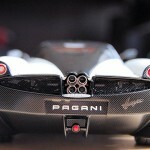 21 Responses to "REVIEW: AUTOart Pagani Huayra"
Great review as always !!! Cant wait for the red one . Do you know if they will make a blue one?? The rumor is blue was one of the four scheduled colours, under pressure from Pagani fans they subbed the red for the blue. 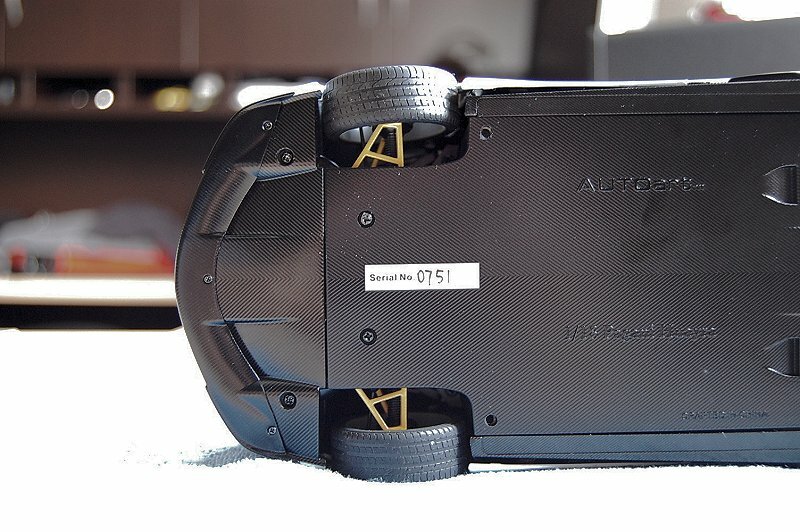 Knowing the R&D invested in this model I’m sure AUTOart wants the best return on investment. I foresee more colours being announced soon, a one will definitely be blue. Yeh! its quite an amazing item and a must have. 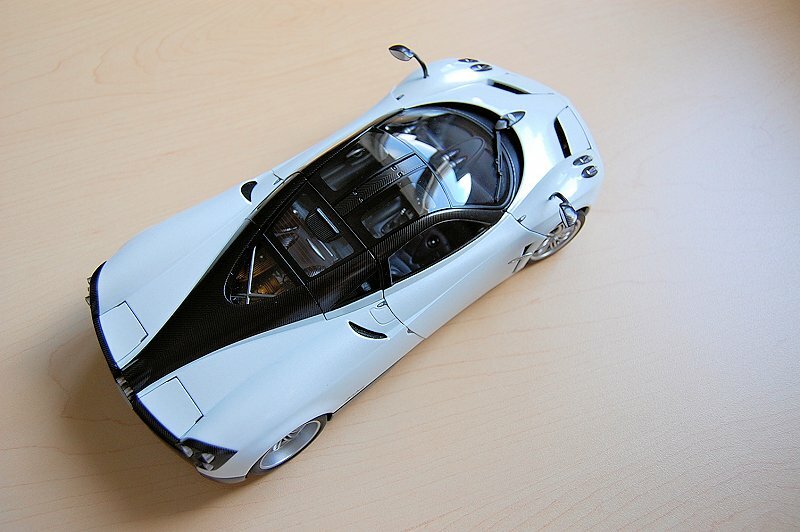 Will wait for the Metallic Silver or bronze the most appropriate color for such an elegant car. Kudos for this one. 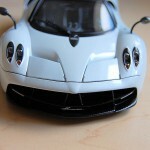 You Autoart surely drain our pockets with all those upcoming top of the line releases. One question, can the front carbon fiber spoiler be removed? 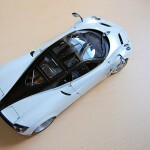 I have written a review for the German site Auto&Modell.de last weekend. It´s amazing how we have put forward the very same arguments and pointed out the very same features. It is nearly as if our reviews were mere translations of each other. 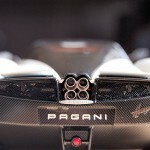 The only small point I would like to add: AUTOart have forgotten the Pagani logo on the steering wheel. 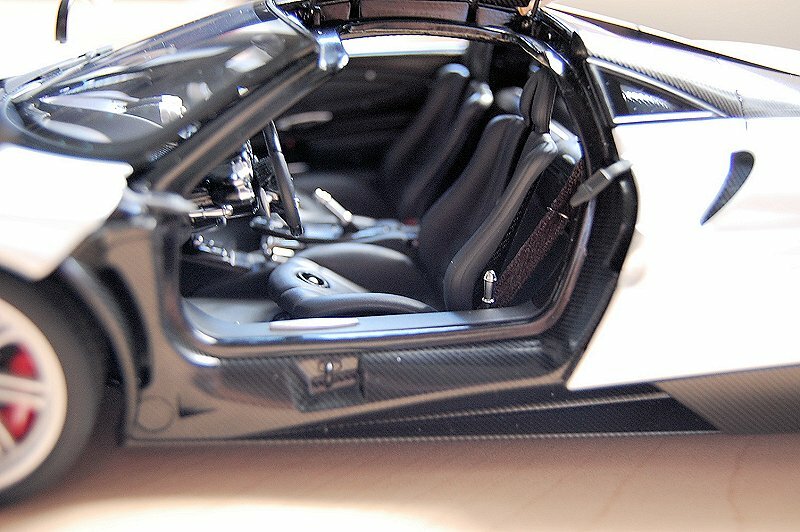 And a tan interior would contrast better with the carbon fibre. 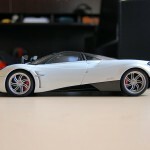 Yet I have come to the same conclusion: What we see here is most probably the model car of the year on this scale. Love to see the review, please forward a link? Thanks for the information on the steering wheel logo. 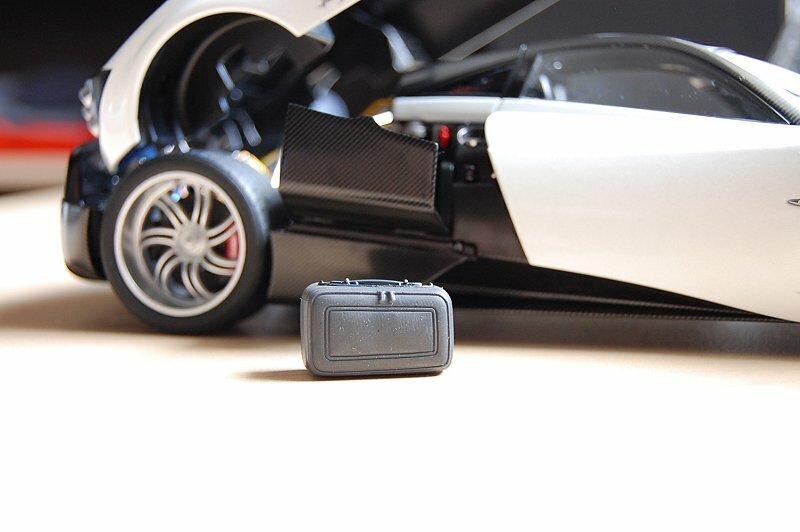 Yes IMO the model is exceptional, though I don’t understand the higher price point based on the old Zonda R. But as I stated when you compare the higher priced resin brands this model is a definite steal. 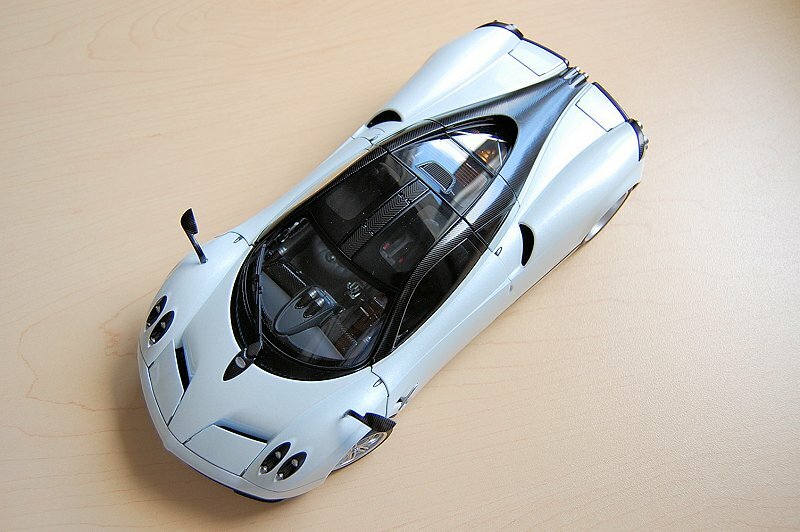 For collector’s looking for a good decent priced alternative to the AUTOart Huayra look into the recently released and reviewed Welly piece. Well, all the prices have gone up since the Zonda R, plus AA probably know perfectly well that they have got a winner there. 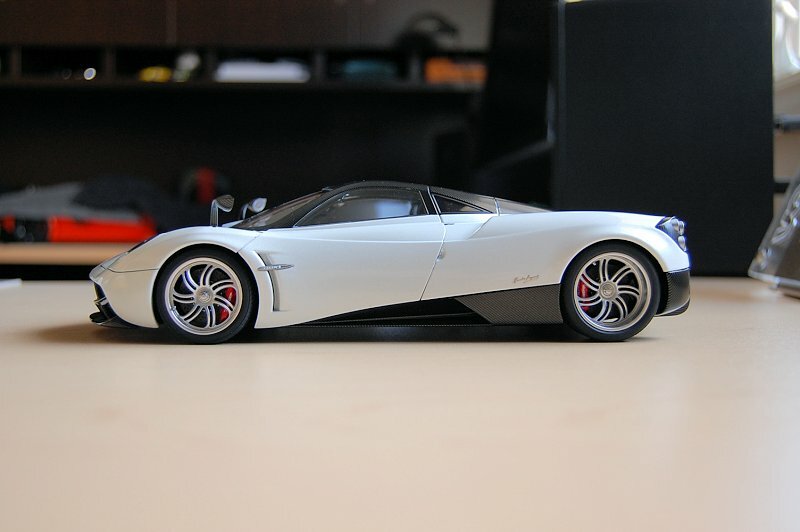 I fully agree: If you are simply looking for the BEST Huayra in 1/18, the AA is it. 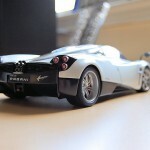 The model is very beautiful, but I find a shame the smooth tyres with no brand. 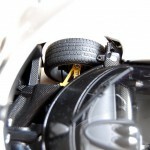 In my opinion naked tyres are acceptable only on a toy not on such a quality (and expensive) model. What do you think about this? Honestly the tire stamping doesn’t really bug me. If it was added, sure nice bonus, if not I’m okay with that. Personally I agree to Riccardo! 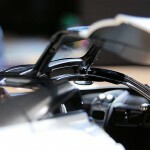 Type stamping is a part of detailing… and really gives better impression about the model! 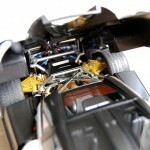 Any way AA has done excellent job with the model detailing..
Venden estos autos a escala?? Ok guys, I actually doesn’t know which to go for next. 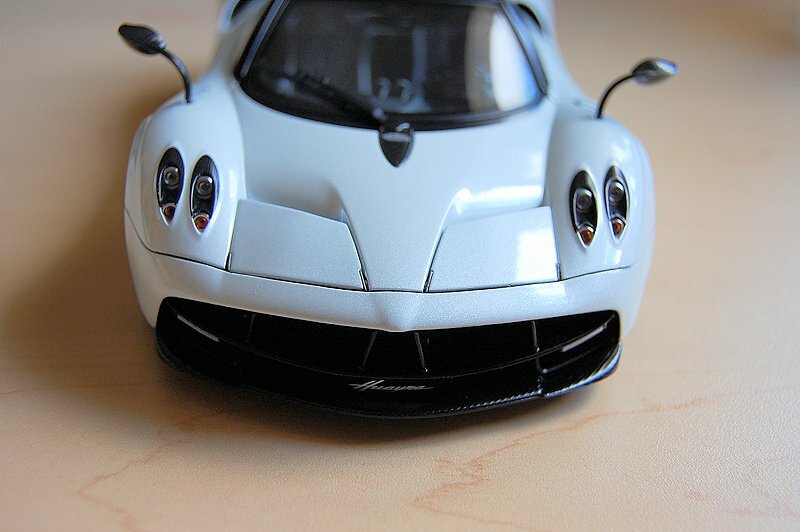 Autoart pagani zonda r or Autoart pagani huayra? Hey guys… If any of you can see this comment anyway. There are two mistakes. 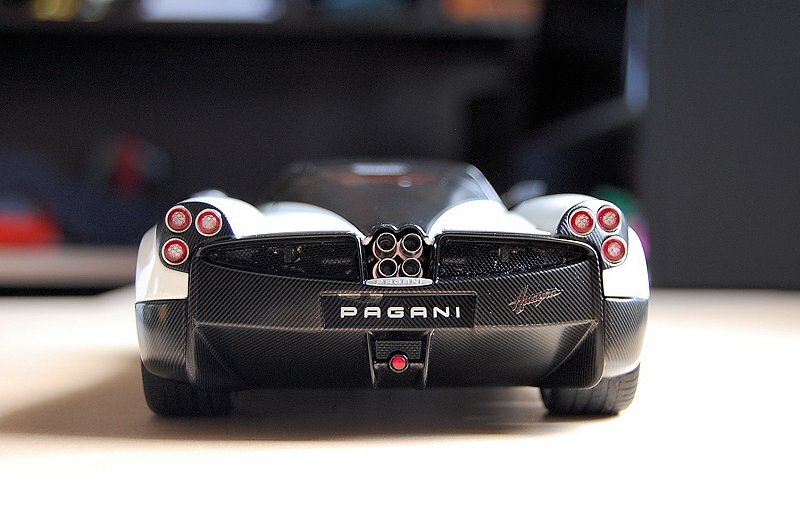 The model actually has a black pagani logo stamping on the steering wheel, but it’s hard to see because it is black. 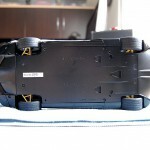 Second, the doors of the driver’s side actually stays in the open position, if you read the instructions shipped with the model. The instructions actually said you need to use the screwdriver to tighten the screws on the door. That might be true for the steering wheel. I can’t confirm as we don’t have the White model with us anymore. 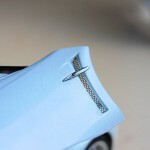 That being said AUTOart should of provided layered effect in the decal to illustrate the embossed look. As for the doors, they were adjusted, no change. I am positive there is stamping. 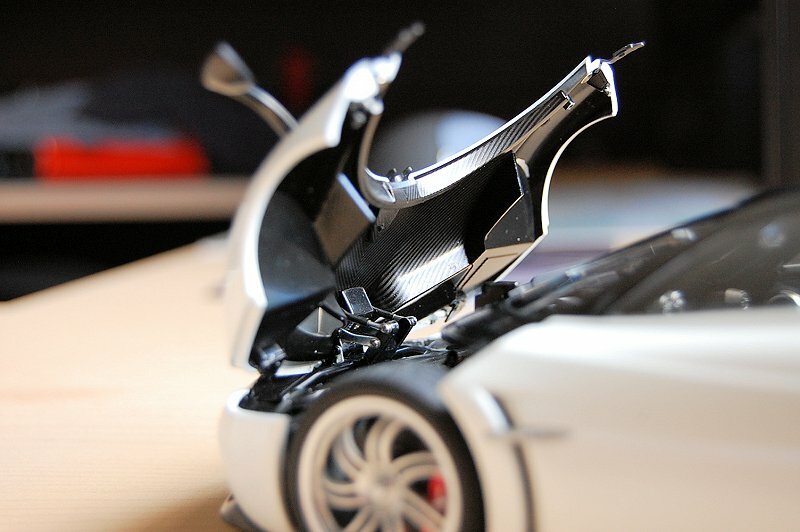 But I think it’s just a problem with your model that the doors didn’t stay upright because it did on mine. Just got me one of these. Very nice indeed.